Want to impress your clients? 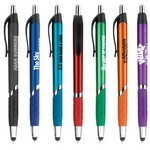 Try our stylus pens customized with your company logo and contact information. Our personalized stylus pens are a great swag bag item for tech companies whose clients regularly use iPads and other tablets. These promotional stylus writing utensils are used to easily navigate or provide greater precision when using touchscreens. 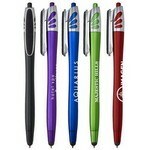 Promote your business with personalized logo Metallic Blair Retractable Pen with Stylus. Custom promotional pens are a great way to leave a lasting impression. 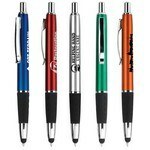 Promote your business with custom logo Mativo Ballpoint Retractable Pen with Stylus. Custom promotional pens are a great way to leave a lasting impression. The Shea Stylus Pen features rubber grip for comfortable writing and allows inserting brand details to make interesting Business Giveaways. 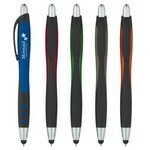 Promote your business with personalized logo Vienna Stylus Pen LaserScribe 360™. Custom promotional writing instruments are a great way to make an impression. 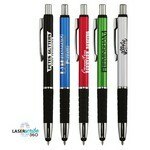 Promote your business with personalized logo Bridgeport Stylus Pens. Custom promotional writing instruments are a great way to leave a lasting impression. 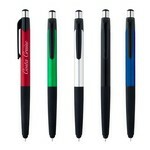 Browse customizable logo Porto Plastic Ball Point Stylus Pens. Personalized writing instruments are a great way to market your brand and impress your clients! Looking for a unique way to promote your business? 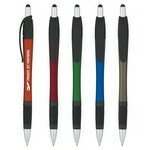 Place your personalized logo on the Yukon Ballpoint Pen with tech Stylus and make a lasting impression! The Sleek Write Silky Stylus Pen features smooth write low viscosity ink that plunger action for releasing and retracting writing tip. It also available in a wide range of attractive colors. Our Velvety Touch Stylus Pen features push down to use pen and retract to use a stylus. It plunger action to release writing tip. It is available in several grand colors. The Mardi Gras retractable ballpoint pen features a smooth writing cartridge and a bold contrasting color design.